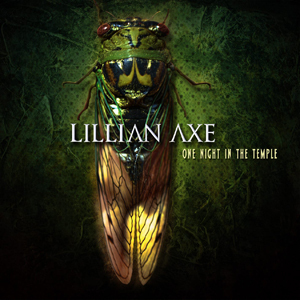 Louisiana Music Hall of Fame members LILLIAN AXE will be releasing their thirteenth album, the acoustic live One Night In The Temple, produced by Steve Blaze, on April 15, 2014 via CME Records / Sony Music (RED) in the USA and Canadaand via Melodic Rock Records / Cargo Distribution for the world. Performed acoustically in an intimate setting housed in a Masonic Temple in the Bayou last Feburary, with their most diehard fans, One Night In The Temple features all their hits including, "True Believer", "Show A Little Love", "Crucified", "Misery Loves Company", "Ghost of Winter", "The Great Divide", "Bow Your Head", "Waters Rising" and the crowd favorite, "Nobody Knows". One Night in the Temple will be released as 3 disc set (2CDs/1DVD and 2CDs/1Blu-Ray), housed in an elaborate digipack. Filmed in high definition, the Blu-Ray and DVD will contain the acoustic performance, fan question and answer session, videos for the songs "Caged In" and "Death Comes Tomorrow", live concert footage from their July 4, 2013 performance at the Paragon Casino and behind the scenes footage. "Sad Day On Planet Earth"
"Dyin’ to Live (Shades of Blue)"